After a month of Ramadhan .. Syawal is here! My hubby and I spent the nite before cleaning up the house .. we vacuumed, mopped, lay out our carpet, put two small cushions on our sofa, put the Hari Raya goodies in little containers for guests to savour .. hehehe .. and much much more .. 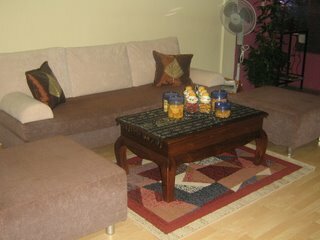 This is a pic of my living room .. very simple .. taken the very nite after we have cleaned the house. 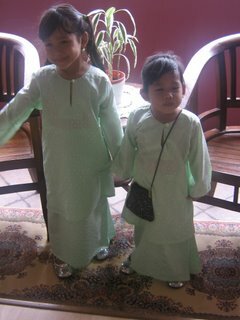 Oh ya .. this is a pic of my two angels in their Hari Raya garb taken at our balcony just before we left for my mum's place yesterday. OK .. I would like to wish all fellow Muslims - Happy Hari Raya, Minal Aidin Walfaizin! Selamat Hari Raya! Maaf Zahir dah batin. i mintak maaf kalau selama ni I blog I ader terkasar bahasa ke atau gurau gurau yang tak ader logik ke, I mintak maaf aje lah kay. Datang lah umah!!! Bawa yoyr angels sekali. I dah check doctor dah. Pregnancy test ambik sampai dua kali. Tgk ah if still never come I pergi balik lah. So worrying lah, first tim kena gini. Oh I will be working at Changi Sailing Club. I think Ros pernah datang sana. The place is nice really kalau I kerja weekend you turun ah bawa the 2 darling angels swimming ke, the place is very relaxing really.